There are many reasons due to which you need to report an issue, if you have any problem with Google Search or you want to give your opinion about how it’s working. 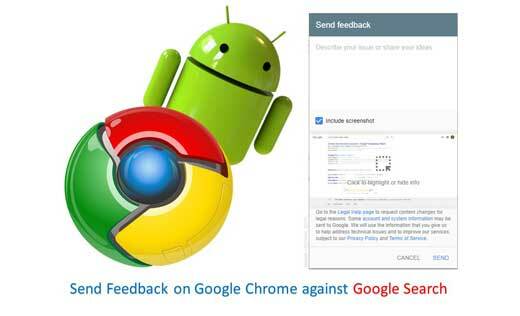 In that situation you have to know how to send feedback on Google chrome against Google search. After receiving your thoughts, google will check your review and if required then improve the Google search experience for others. During surfing on Google Chrome, If you have any problem with Google Search and want to give your feedback about how it’s working. In that situation you must have to send your feedback include with snapshot. Lot of person using this feature to remove a copied content from Google Search. Most of the bloggers when publishing his contents at his website, different other users copy and paste the same contents and publishing them at his own website. Due to that original authors website will lose his traffic and ranking both. In that situation you can also report to Google to take valid action against those website. If you’re have an issue with Google Search, or want to tell Google about your thoughts, how it’s working, you can send a feedback report to the Google. You can send your feedback via Android, Computer, iPad & iPhone. Let’s start how to do this job. If you want to send your feedback via computer then you have to take following simple steps. Step 1: First you have to do any search at Google Chrome. Google shows you all related search results in front of you. Step 2: If you found any issue against Google search and want to send feedback to Google. In that situation, scroll down the page and reach at the bottom of the search results. Step 3: Click on the Send feedback option. In Send feedback box, you have to enter a description of the issue which you’re seeing. Step 4: If you want to report against any search then, you can highlight the part of the page and click on the Send button. If you want to share your feedback via mobile browser then you have to use same steps which you use via computer. To send your feedback against Google app at your mobile phone then you have to take given simple steps. Step 1: Open your Google app at your Android phone. Step 2: Locate more option in the menu bar. This bar located either at the top side or bottom side of your Google app window. Enter a description of the issue which you’re seeing. Now tap on the Send button. After receiving your feedback, Google review your feedback and use it to improve the Google Search experience for all the users.